A court of appeal has ruled partly in favor of the Santa Ana Police Department and partly for officers involved in a controversial marijuana dispensary raid who sued the city over its investigation. 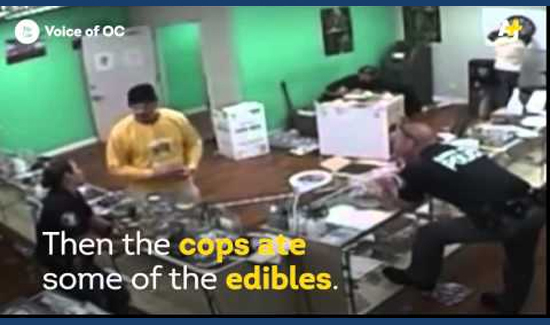 With the decision by the Fourth District Court of Appeal, released Tuesday, June 13, the case – involving three Santa Ana police officers who raided Sky High Holistic in May 2015 and were caught on video eating edibles – goes back before a trial court to rule on the merits of the officers’ allegations that the city violated their rights. The Santa Ana Police Officers Association later in 2015 sued the city, police department and police chief alleging they violated part of the Public Safety Officers Bill of Rights Act by refusing to produce tape recordings of the initial interrogations of the officers, transcribed stenographer notes and any complaints or reports made by investigators or others, before interrogating them again. The court of appeal ruled in favor of the police union, stating the defendants were “required” to produce the recordings and data before interrogating both officers a second time. Santa Ana spokeswoman Alma Flores declined to comment, and police department officials could not be reached for comment on Wednesday. In its lawsuit, the police union also alleged the city, police department and chief violated the California Invasion of Privacy Act by using video recordings made by the dispensary owners without the officers’ knowledge, as evidence in an internal investigation. The court of appeal sided with the defendants, affirming an earlier judgment that it wasn’t a violation. “We’re reviewing that to see if we should appeal that to the California Supreme Court,” Glave said.